So the last few weeks has been quite the learning experience for me - decades of over computer usage seem to have caught up with me and my occasional eyeglasses for late night driving/etc are being used a bit more frequently. So when i got my new prescription and needed new lenses, an email from long time NOTCOT reader, Dave Barton of David Kind, seemed perfectly timed! 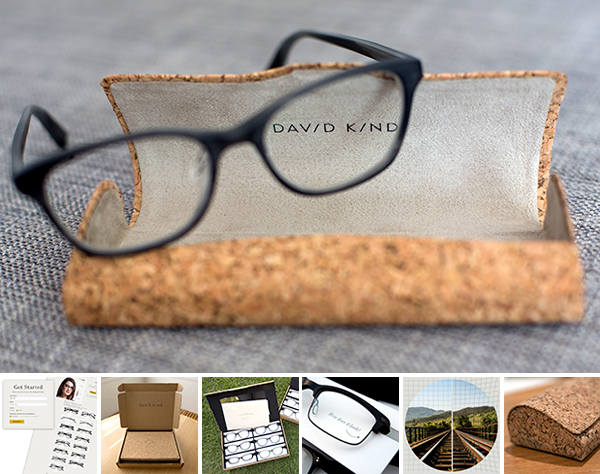 Beyond the stunning cork packaging (swoon) and the high quality, luxury frames, what has been most exciting is learning about the advances in eyeglass lens technology! When i got new lenses in my old glasses updated to the new prescription, there was no question about what type of lens i wanted besides anti glare, transitions, etc… I didn’t even know what to ask about! Shawn on the other hand, has been in pretty thick glasses since he was 4, and is never without his glasses/contacts. While in Nashville we even found his stash of old glasses and how the lenses have been slowly evolving and getting thinner/lighter, from glass to polycarbonate and now on to High Definition and Trivex. Luckily for us, David Kind is based right here in Venice, CA! With years in the eyewear industry, Dave Barton spent a lot of time at Spy+ and Oliver Peoples/Luxotica as well as starting another eyewear company before launching, David Kind - so it’s been great getting caught up on the options. From first touch - it’s easy to see and feel the quality of the frames and the attention to detail on designing and perfecting every little thing. But it wasn’t until i just got my glasses in my prescription that i understood the clarity i’d been missing with my old lenses. While the frames and process may feel like other online ‘try at home, then buy’ eyewear stores - what has surprised me the most is how much attention to detail and how knowledgable the team at David Kind has been along the whole process. They work with you to find the right pair, make sure to find the best lens for your prescription, get everything aligned and adjusted and customized as needed… and the packaging is just awesome too. Take a peek at what i’ve learned and all the details on the next page! What happens when a professional chef (Jennifer Scism of Annisa and more) has to spend a lot of time in the backcountry? 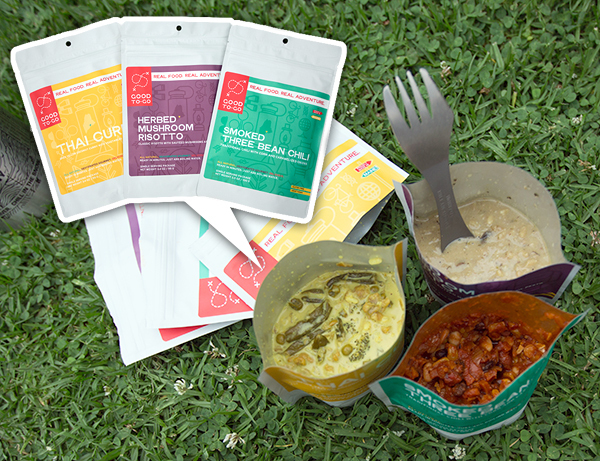 Good To-Go gourmet dehydrated meals! I’ll admit i was first drawn in by the bright, bold, playful packaging - especially that background pattern! But when it comes to dehydrated meals it’s all about the taste - and the ease of rehydration. Think of it as fancy cup o’noodles? They say “Each recipe was developed with one goal: to elevate your expectations of what trail food can taste like.” Currently there is Thai Curry (Spicy yellow coconut curry with vegetables and jasmine rice), Smoke Three Bean Chili (Traditional chili with corn and caramelized onions), and Herbed Mushroom Risotto (Classic risotto with sautéed mushrooms and basil pesto). We received one of each to try and had a little faux-backpacking dinner out in the yard last night to try it out. Basically just tear it open, add boiling water, zip it back up, let it sit for 20 minutes - then bon appetit! See all the close ups on the next page! Justine reported back with so much gardening inspiration in her post about Grow London… and i have been fixatedly curious about those giant tea bags! 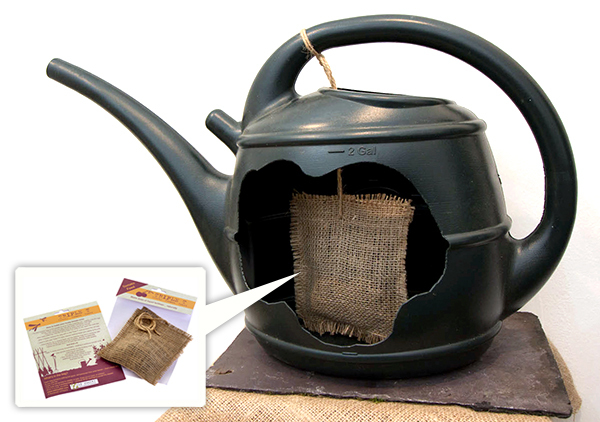 So it turns out the giant tea bags are Old Mucker Fertilizer Tea Bags - the hessian bags (most of which “are sourced from a coffee supplier and recycled”) are filled with various chemical free solutions to make magical muck to feed your plants. You steep the giant tea bags over night and feed your plants! There is Triple N: Nourishing Nettle Nectar - since Nettles are packed with naturally occurring nitrogen. Triple C: Classic Comfrey Cultivator - Comfrey is packed with potassium, the essential plant nutrient needed by flowers, seeds and fruit. Triple T: Trusty Tomato Tonic - Sheep muck is packed with potash, the very thing tomatoes, beans and root crops love. Triple M: Mighty Muck Marvel - Horse muck is packed with nitrogen and potassium, the very things that help roses to thrive. Yes. It’s basically manure in a bag… Manure Tea! Fun idea, lovely packaging concept, and great booth display - check out more pics on the next page! p.s. I wish i had some to try for my avocado tree - it’s finally bearing fruit for the first time, they are nearly golf ball sized! 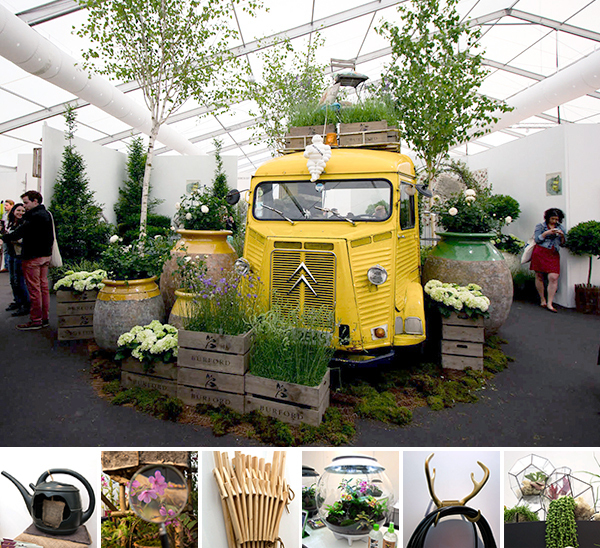 Last week we attended the garden party preview of Grow London, the contemporary garden fair at Hampstead Heath. While we love the tradition of Chelsea, Grow promised contemporary new solutions for urban gardeners and we were excited to see what it was all about! The preview supported the Garden Museum and offered a fun mix of installations, contemporary garden products and more unusual items like fertilising tea! Kellogg’s Cereal: Good. Night. Snack. I don’t know why this is so amusing today. Apparently Kellogg’s has created “Limited Edition Packaging” for some of their cereals - having them go dark. They actually have the night sky filled with stars instead of their brighter usual boxes… I thought my mom was joking - so she scanned over a coupon as proof. My first thought was - are there glow in the dark marshmallow stars inside? Second thought - are there really people out there who didn’t know they can eat cereal at ANY hour? Third thought - what’s going on with the cereal industry to need to change ONLY the packaging to tell people they can eat cereal at night?!?!?! 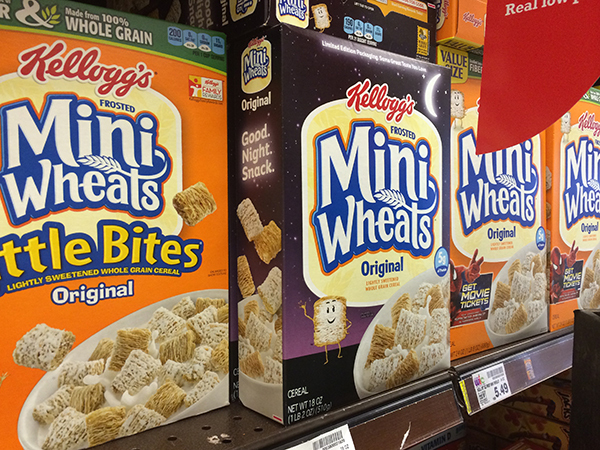 But maybe it worked - when we noticed the box of twilight Mini Wheats - we bought it. 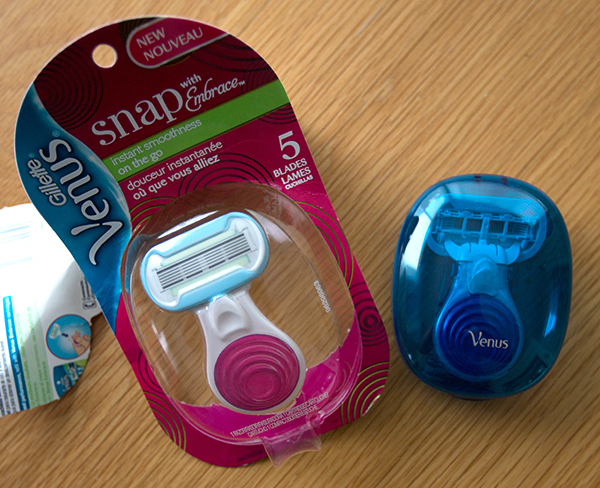 And i had to take pics of how absurd the packaging is to share with you. And now i’m totally having some at night… See it all on the next page! Here’s the latest from NOTCOT’s London-based editor and resident zoologist, Justine Aw as she visits the London graduate showcases. 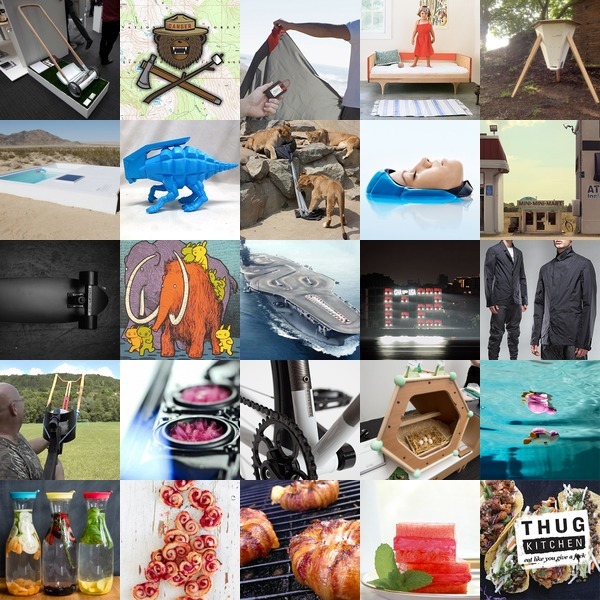 This post is from Central Saint Martins Degree Shows, including work from both Degree Show One and Degree Show Two. What inspires me? 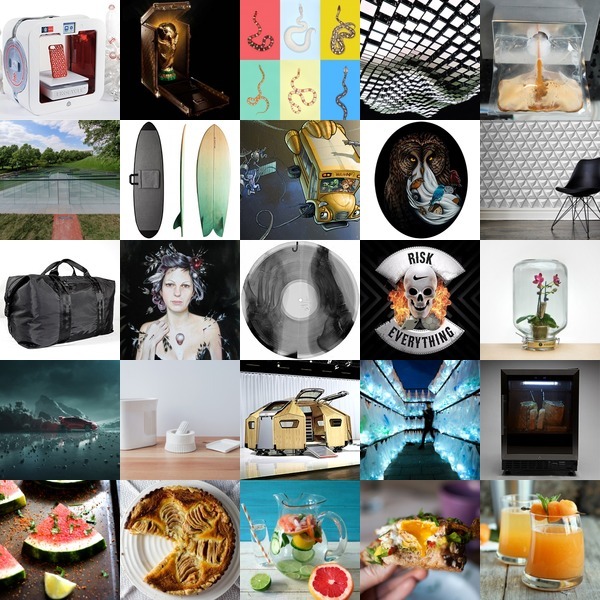 Here’s a taste of what’s recently come up on NOTCOT.org as well as visual deliciousness from Tasteologie. Click the pics to find out more. 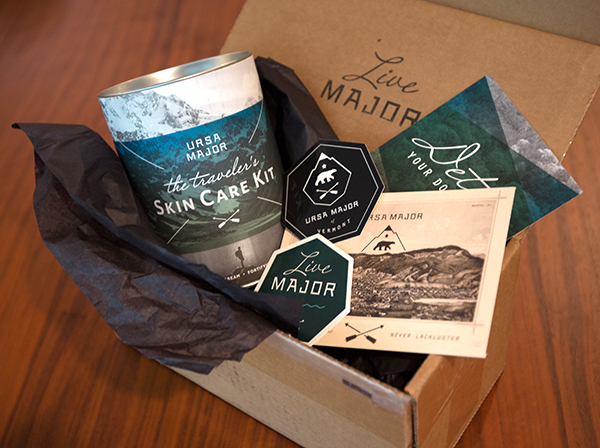 We recently posted Ursa Major’s Traveler’s Skincare Kit on NOTCOT.org, and they were kind enough to send one over for us to check out in person! The Traveler’s kit contains minis of their Face Wash, Shave Cream, Face Balm, and five tonic-infused bamboo Face Wipes in a fun canister that shows off some of their lovely branding. In addition to the kit, there are also some stickers and cards supporting the Live Major motto and my favorite, “Always Awesome. Never Lackluster.” The Burlington, VT based Ursa Major is all about natural, organic ingredients to bring out your best. They test every product until it is a yes to the following three questions: “Is it effective? Is it healthy? Is it sublime?” Take a peek at it all up close on the next page. 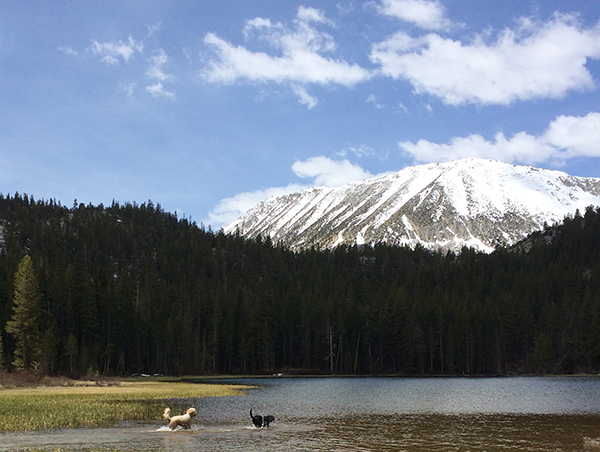 We recently disconnected from the world (and our technology) and disappeared up to Rock Creek up in the Mammoth Lakes area at the foothills of the Sierras. About a 5 hour drive from Los Angeles, 4 humans and 2 dogs went to go play in the woods! It dumped snow the first night we got in, but luckily it started after we were tucked away in our cabin - and the NOTpuppy, Bucky was lucky to catch his first taste of snow (which he LOVED jumping chest deep into) and the last snow of the season. The highlight was definitely good times with good friends and a chance to watch the dogs run free - frolicking through the streams and meadows till they just couldn’t handle anymore… which resulted in coming home and sleeping for a few days! Along the way we also found some amazing jerky, delicious pie, and had a near catastrophe with some flying carrion. 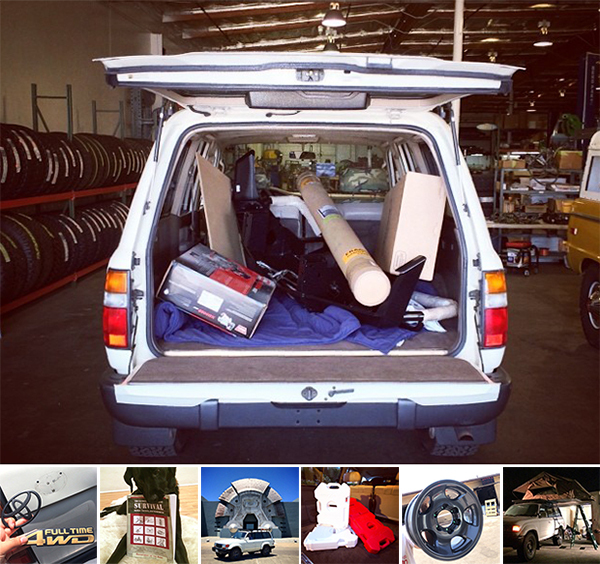 Take a peek at the adventures (and a taste for what the NOTFZJ80 will hopefully lead to!) on the next page! Here’s the latest from NOTCOT’s London-based editor and resident zoologist, Justine Aw as she visits the London graduate showcases. This post is from Show RCA 2014. The RCA Architecture school’s Hack Circus by Andre Kong was hard to ignore. The display was more like a desk you’d find on Steve Zissou’s ship. 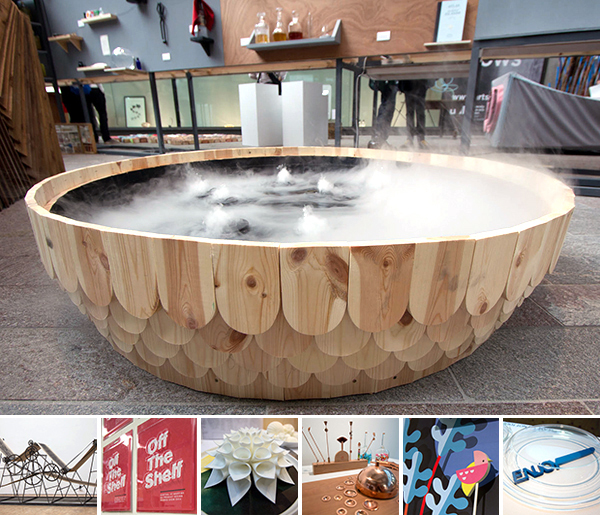 The wooden octopus stool, aquatic illustrations, and electronic fish in a bowl caught my eye. What it actually is… “A theatre for the post-tragic condition of subverted capitalist technologies”. In Kong’s own words: “Here the first crowd-funded Hackfest (the annual hackathon event) is hosted in its germinal amphitheatre and from it THE CIRCUS IS BORN. As the alienated community grows and floats down the Thames, ties with power structures, ideology and the obsolete value system of the city are gradually severed until it sets itself free, beyond territorial waters and, in an act of ‘sousveillance,’ taps into a submarine Internet cable in the North Sea.”. 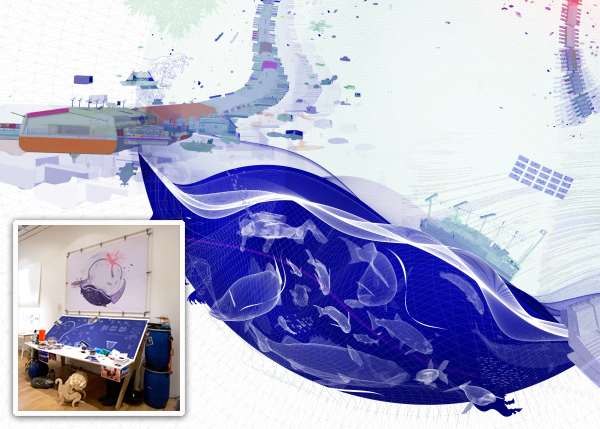 A fascinating, beautiful, interactive project. Take a peek at the details on the next page! The Structure of Protection by Oluwaseyi Sosanya from the Innovation Design Engineering program. The project is a beautiful loom specially designed for weaving in three dimensions. 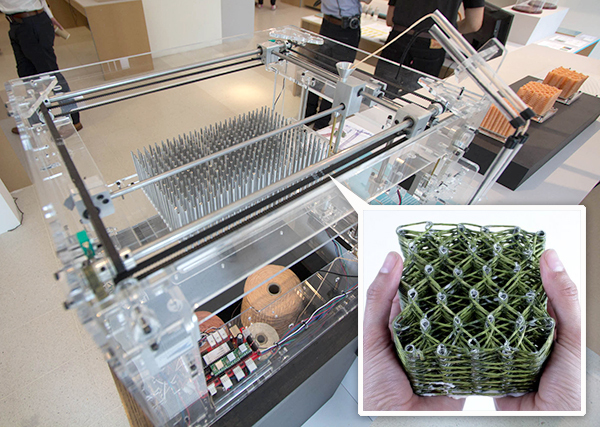 Using a single thread, the loom can create complex structures that are incredibly strong, essentially becoming a 3D printer of weaving. We love the way the project combines modern techniques with the traditional. Sosanya even visited fabric mills in the North of England to research mechanical weaving practices. See the machine and its outputs on the next page. Another of my highlights from the Design Interactions program was Endless Forms/Endless Species: Explorations in an Evolutionary Development Park by Kathryn Fleming. 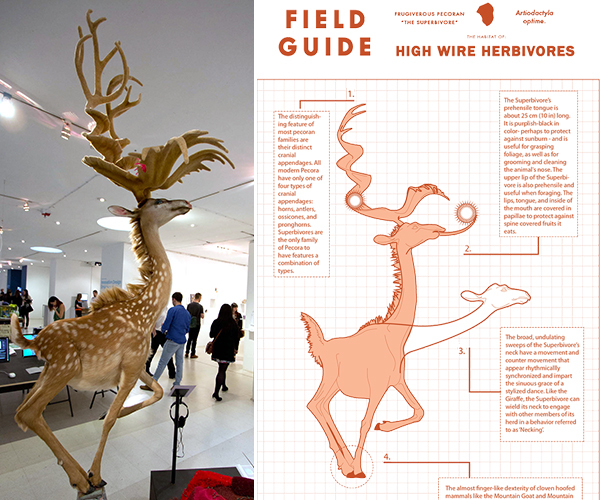 I loved her combination of imaginary creatures alongside taxidermy and beautifully illustrated field guides. The almost Seussical creations are the charming inhabitants of a fantastical Regent’s Park. We’d love to find wild High Wire Herbivores, Ground Working Insectivores and Retro Reflective Carnivores! See it all up close on the next page.